In a large pot or Dutch Oven, heat your Oil on hot. In a large shallow bowl, mix Onion Powder, Garlic Powder, Dry Bread Crumbs, Whole Wheat Flour, White Flour, and Nutritional Yeast with a whisk until it is blended completely. One at a time, take your pickles with your left hand and drop them into the Flour Mix, and then coat with your right hand. Your hand being used to fish out pickles will get wet, and your other hand will get kind pasty - so if you keep each hand doing a separate job, the whole process is a little less messy and easier. Once you have a coating on your pickle you like, remove it with your right/wet and pasty hand and carefully drop into the hot Oil. 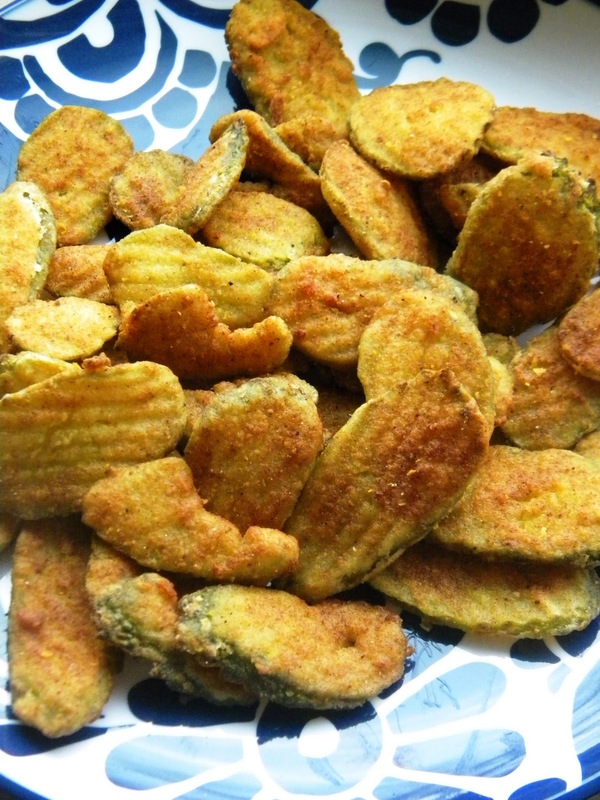 They fry fast, so once you see the coating turn a nice light golden brown, remove the pickle with a slotted spoon and place it on a plate with a paper towel on it to soak up extra Oil. Just keep repeating this process till you've fried the whole jar. Once you get the hang of it, you can do a few at a time, but start off with one so you can see how fast they brown and if you want to adjust how much coating you're getting. If you want a thicker coating, coat the Pickle like it says above and then set them aside for 30 seconds to kinda soak up the dry coating. You'll see the powdery coating start to get kinda pasty. Then recoat with the Flour Mix and drop in the Oil like is says above. Serve warm, and if you're feeling like a more Southern BBQ experience, you can always add a little pot of Vegan Ranch Dressing or some Bourbon BBQ sauce to dip it in. Holy wow, this is a beautiful thing. I love fried pickles, and you normally can't get them out because they are dipped in buttermilk. I never thought of Virginia as "the south," being from Mississippi, but after 10 years of living in New England, I went there last year and it felt like a visit home. Want! Gah, the photo makes me drool like a fool! Any idea what the temperature setting on a deep fryer would be for these babies? Yum! These look great! I've never had fried pickles before. I just need to track down all of these ingredients, hm.. I'm not sure what temp you should set a deep fryer for. We used to have one but it only had low - medium - hot settings. I did a little researching though and some of those expert deep fryers like Ms. Paula Dean say set your fryer at 350. There are a few others that say 375. So it's kinda your call on how hot your fryer runs. Hope that's helpful! Let me know how they turn out if you make 'em!